So, Professor Franco Moretti has identified `the 1% Problem’ in the domain of novels. `The history of the world is the slaughterhouse of the world, reads a famous Hegelian aphorism; and of literature. The majority of books disappear forever—and “majority” actually misses the point: if we set today’s canon of nineteenth-century British novels at two hundred titles (which is a very high figure), they would still be only about 0.5 percent of all published novels. And the other 99.5 percent? As a member of the Digital Humanities Research Group, I commend that landmark Moretti (2000) article The Slaughterhouse of Literature (2000) to you; it is available online, here. Moretti’s book Graphs, Maps, Trees: Abstract Models for Literary History (2007) is also excellent, in my view. In Part 3 of the book, `Trees’, Moretti (2007) uses an evolutionary model to examine the development (and also, extinction) of various genres in literary fiction (novels). `In his Way of the World, Franco Moretti proposes the very interesting idea that even literary genres cannot survive without cultural variety. 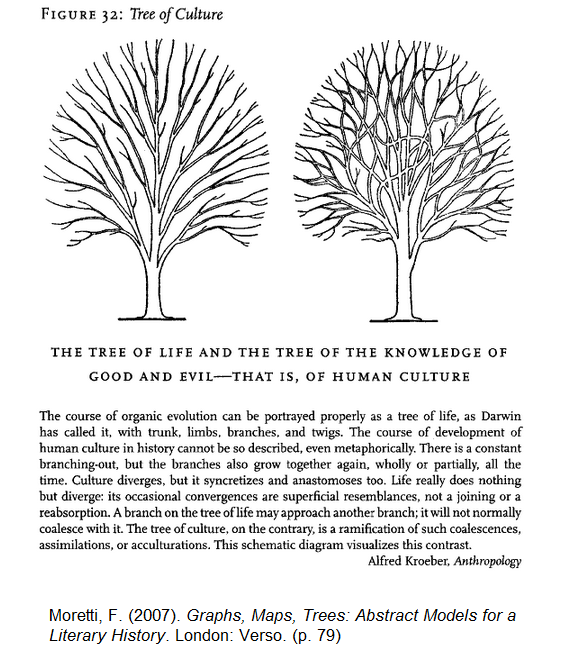 What I also find interesting here is that the `tree’ on the left (in the diagram above), indeed (as Moretti notes) reflects the evolution of biological species under natural selection diverges (and only diverges; indeed that is the definition of species – that they cannot interbreed), while the `tree’ on the right shows how culture diverges – but also reconnects (as, ideas, processes and products spread across – and also between – cultures, and sub-cultures). However, given not just natural selection, but also artificial selection and genetic engineering, we can now recombine genes and proteins and create new and different organisms, such as, say, GloFish. In other words, due to culture (i.e. science, and the arts) we are clearly no longer just in the domain of natural selection. `There are many ways of being alive, writes Richard Dawkins, but many more ways of being dead – and figures 30 and 31, with all those texts that were so quickly forgotten, fully bear out his point: literary pathology, one may almost call it. But instead of reiterating the verdict of the market, abandoning extinct literature to the oblivion decreed by its initial readers, these trees take the lost 99 per cent of the archive and reintegrate it into the fabric of literary history, allowing us to finally ‘see’ it. 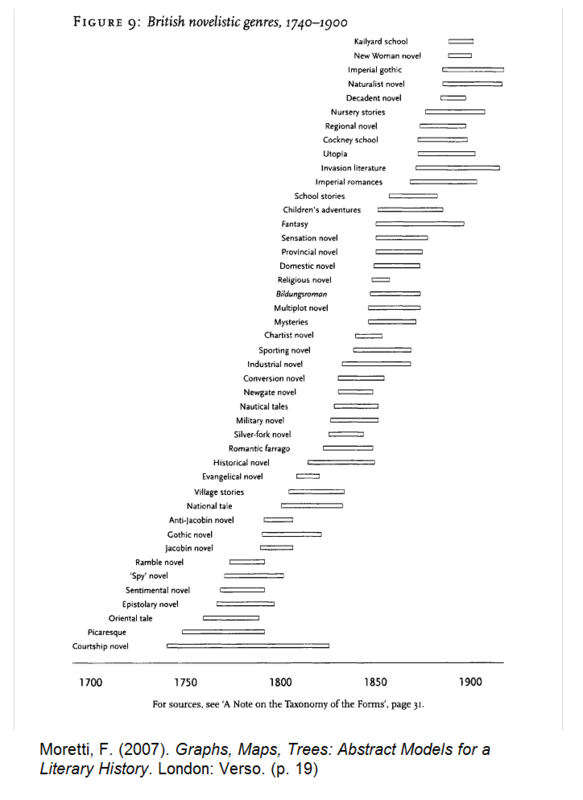 Moretti (2007) also provides a wonderful graph of British novelistic genres (1740-1900), noting the `lifespan’ of each genre (see below). Moretti invokes Kuhn’s `normal science’ and suggests that on average, `normal literature’ (a new genre, or paradigm) lasts around 25 years or so, in this view. This fascinating approach by Moretti, using statistics and quantitative analysis in the Humanities is called `distant reading’ by Moretti and others (as opposed to say, the approach known as `close reading‘ of course), and arguably provides a more holistic view of `large-scale patterns’ in the evolution of culture. I commend Moretti’s work to you, and I also look forward to reading much more of it. De Vany and Walls, “Bose-Einstein Dynamics and Adaptive Contracting in the Motion Picture Industry,” Economic Journal, November 1996, p. 1493. Moretti, F. (2007). Graphs, Maps, Trees: Abstract Models for a Literary History. London: Verso.